This evening, I suddenly had the urge to have some cake. Don't ask me why, I just felt like having one of those cakes you see in the bakery. One thing led to another and before I knew it, I was already in front of this bakery within walking distance from my Wangsa Maju home. The bakery is called The Baker's Cottage located at Section 2 Wangsa Maju just behind the Wangsa Maju LRT. 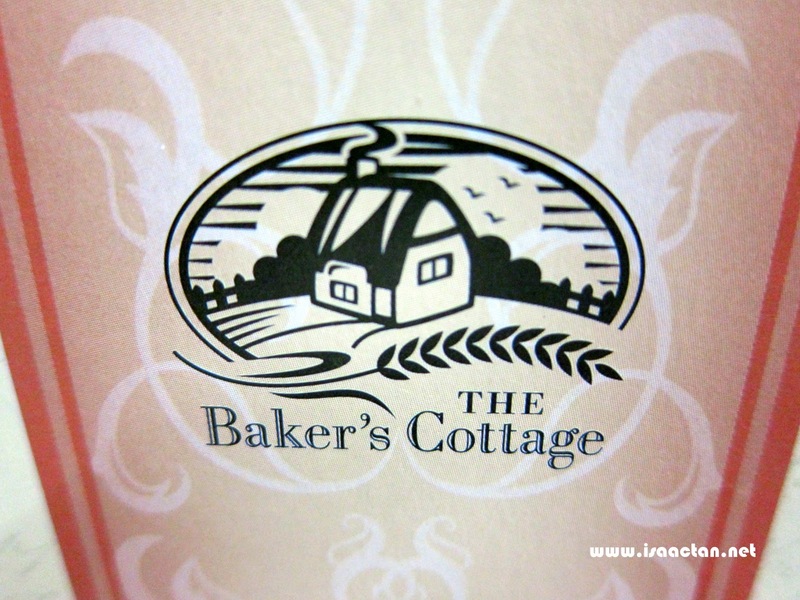 Baker's Cottage already had their Chinese New Year decorations up. 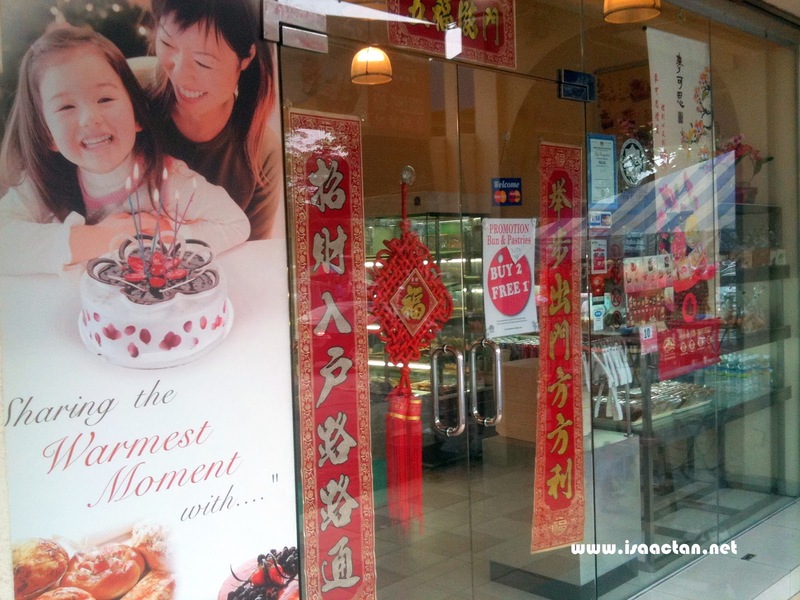 I normally come to this bakery for its mooncakes during the mooncake festival. 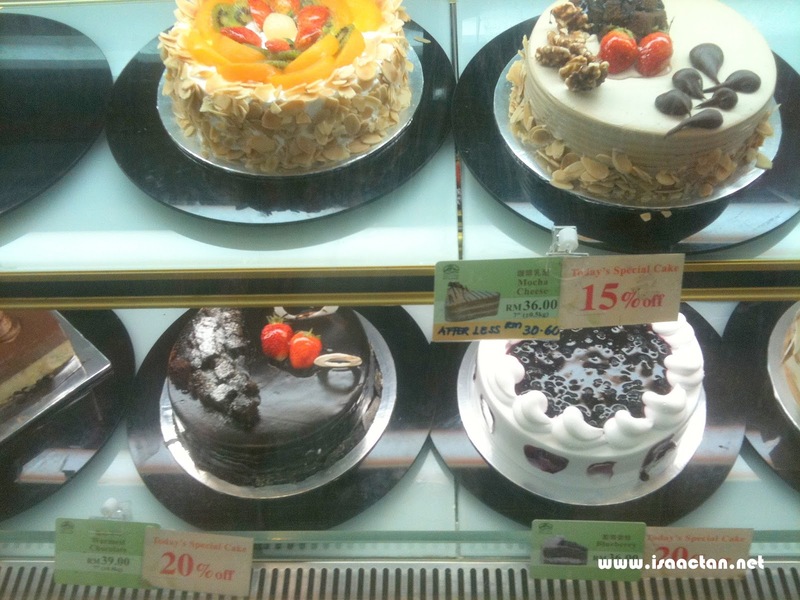 There were quite a number of cakes and all types of breads in this shop. My partner was with me, so we were eyeing all the yummy cakes in the bakery. I think she was more excited than I was. 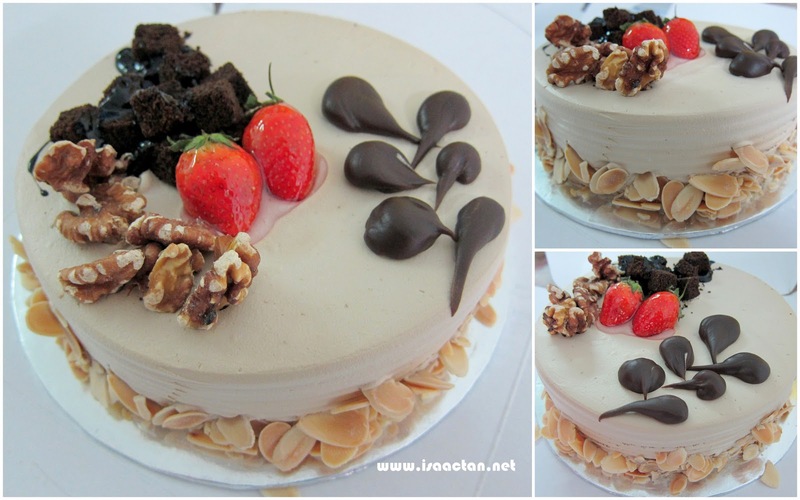 We finally decided on the Mocha Cheese Cake as it looks good, is on sale, and I love mocha! Also the fact that I could see sliced almonds lining the side of the cake makes it even more tempting. 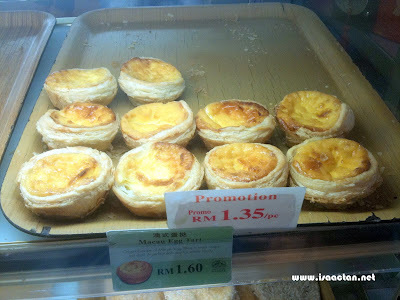 We bought 1 mocha cheese cake for RM 30 after a 15% discount, plus 2 egg tarts which I bought on impulse. 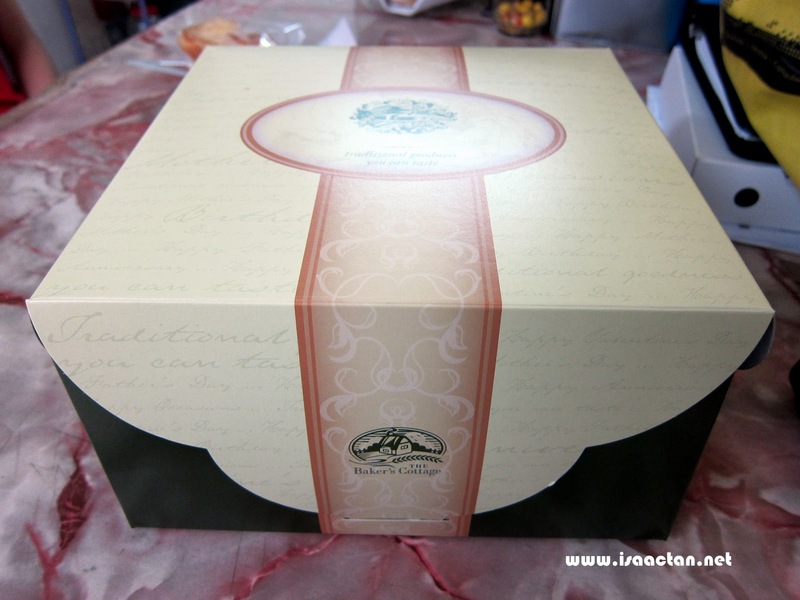 After carefully opening up the packaging, I slowly lifted the cake out. It does look delicious, and I assure you, it is delicious! The cream wasn't too heavy, there was a tinge of coffee, and coupled with the almonds, very nice indeed. We could not finish the whole cake, which was expected, so the remaining was placed in the refrigerator for future consumption. 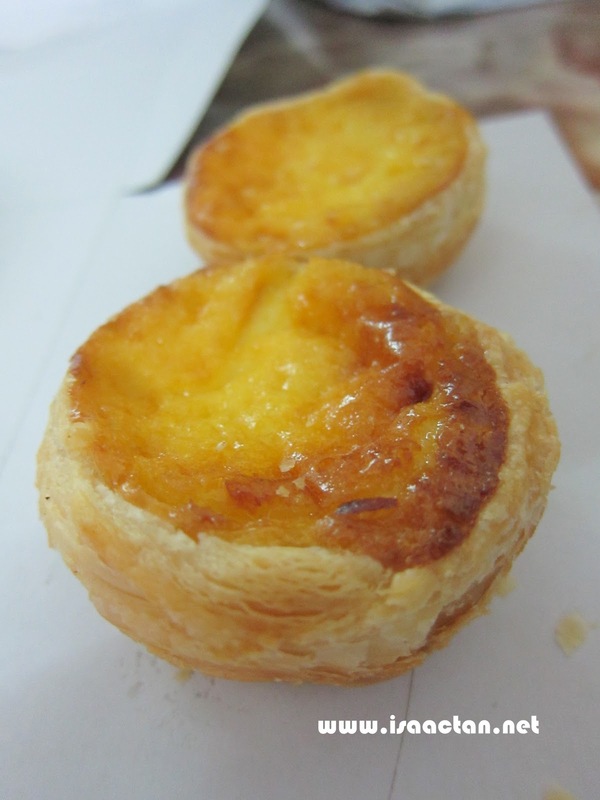 Oh, and the two egg tarts were nice as well. I have always liked egg tarts like these, some bakery called them Portuguese egg tarts, but Baker's Cottage referred it as Macau egg tart. tart telur tu.. auu auuuu.. x tahaannnnn..! wow..definitely one yummy cheese cake! P.S. : Not a fan of cheesecakes. My students used to give me ALL the time - got so sick of it that up till now, I do not really want to eat anymore. @ Dayah: Hehe, it is delicious. I like mocha flavored stuffs, be it cake or ice blended mocha. @ Suituapui: Wow, you must be such a great friend that people actually send mooncakes over the seas! The mooncake won't get spoilt? Hehe, well I'm the opposite, I lurveeeeee cheesecakes, gonna eat more, grow fat and die off peacefully. Yep, I guess the prices are quite OK, secret recipe would be double the price. Maybe because Tar College is nearby, so my housing area a lot of students. The prices of things here slightly lower. OOOOOH... reminds me of the awesome egg tart!! salivating at the last pic! i want cake..i want tart..
@ aDihAys: Haha! That's my objective, come find me, and you can have it all! The cake, the tarts! Hehehe. :P come wangsa maju, can belanja you makan. Haha.